On the Block: What do you do with a gorgeous white elephant? Last month I wrote about Weyerhaeuser moving from its old Federal Way home to 200 Occidental in Pioneer Square. The month before that, I wrote about converting the top floors of Macy's downtown store to office space — now called 300 Pine — and the ensuing hunt for tenants. 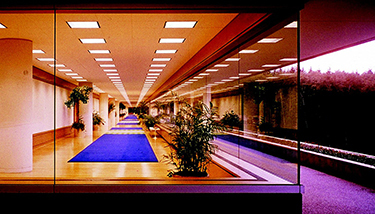 Those two stories converge at the now empty Weyerhaeuser Building, a mammoth modernist edifice that sits on a 425-acre campus. Using about $50 million in borrowed money, Los Angeles-based Industrial Realty Group bought the whole spread in February for $70.5 million. 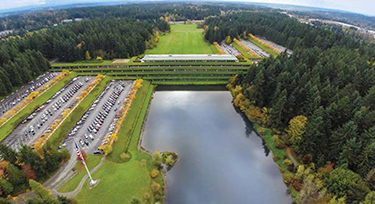 For the next 10 years, Weyerhaeuser will lease back half of its 130,000-square-foot technology center there. The space is north of the iconic office building that you see from Interstate 5. But the privately held IRG is now seeking new tenants and uses for the old campus. Tom Messmer estimates that about two-thirds of the campus is open land, about half of which could be developed for industrial purposes. Do you have 1,300 employees who’d like to work here?